I have compiled a list of the greatest Moscow’s food events in 2017/2018. 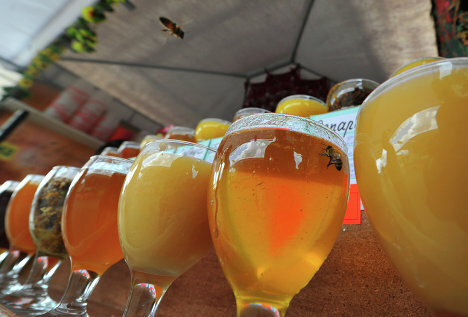 A honey fair (featuring food corners) is always open in Kolomenskoye Park until the end of October. Why not take the opportunity to buy your own jar of Russian honey to take home as a souvenir? “The Moscow Gastronomic Festival” opens in the beginning of October, with 75 restaurants welcoming clients to special contestant set-menus from their master chefs.One of the best attractions of the menus are the prices: customers can taste the main dishes of Moscow’s fanciest restaurants at significantly discounted prices! UPDATED! The Italian market will be held at a recently-opened art space – “Hlebozavod” on October 20 – October 22. It will encompass traditional food corners, beauty zone as well as handmade items and souvenirs. The entrance is free. Operating hours 11.00 – 21.00. Taking place at the Zil Centre, the “Go Vegan” festival is supposed to be one of the biggest monthly vegan festivals in Russia – has space for altogether hundreds stalls and dozens of caterers. Entrance is free, registration is required. For more information, please, click here (in Russian). The “My Pastry” festival will open at Danilovsky Market on Nov 4 – Nov 5 2017. Entrance is free. Those who register here will be gifted with sweet presents. The annual Christmas Fair on Red Square will open on November 29 (approximately) along with the Central ice rink. It will operate until Jan 14. The annual Christmas festival “Journey Into Christmas” will take place steps from Red Square with dozens of special stalls and tents, playgrounds and stages. The event will open on December 12 (approximately). The festival encompasses 38 special zones in the city centre. More than 100 stalls, selling different products, will be placed on the territory of the fair. Operating hours 10 am – 9 pm. The Central Alley of the VDNH All-Russia exhibition complex will become the centre of Shrovetide. All visitors will be welcome to enjoy the entertaining program including the National Pancake Fair, exhibitions and performances, concerts and animation program.The visitors will be treated with hot pies, waffles, gingerbread, Czech sausages, burgers, soft mulled wine and coffee. The “food” highlight of the Shrovetide Fair at VDNH will be a huge range of pancakes with various fillings. Pancakes with homemade jam, with banana and nutella, with salmon mousse, with Bavarian sausages and cheese will be all available. The entrance is free. The annual “Moscow Food Truck Festival” will be held in the middle of April in Sokolniki Park. The event will provide the public with a massive array of creative street snacks to sample. All guests will be entertained throughout the day by live music performances. Entrance is free! The first “Family Secret” okroshka food festival will be held in Sokolniki Park in May. Entrance is free. Cost for tasting coupon for all 5 types of okroshka (including vegetable, meat and fish okroshka)- 1000 roubles. Coupons may be purchased in the park. Okróshka is a cold soup of Russian origin. It is cold and mostly served in summer. The soup combines the refreshing taste of kvass and the lightness of a salad. For more information, please, click here. The leading event in the restaurant industry –“Taste of Moscow” opens in the beginning of June. For 4 days the best city cafes and restaurants will be welcoming clients with special offers and tastings. The “Moscow Jam Fest” opens in the middle of July. Tens of chalet-tents are set in the city to treat residents and guests with all sorts of traditional and exotic jams.Entrance is free. The “WorldFood Moscow” event is the main platform in Russia where food trade professionals, international associations, government ministers and international press can assess the market; network with existing and new clients, as well as conduct and conclude deals for the future.WorldFood Moscow annually gathers international food and drink companies from over 62 countries. If you plan to visit Red Square in Moscow, don’t forget to take advantage of the newly released VOICEMAP audio tours in Moscow which we are excited to present. The Tallest Ferris Wheel in Europe to Open in Moscow!